Anyone visiting the Malvern booth at Pittcon will I hope find themselves not only admiring the sleek design of the Mastersizer 3000 laser diffraction particle size analyzer but also looking much further into how this innovative new system streamlines and simplifies the practicalities of particle sizing. Nowhere is this more evident than in method development, a crucial process for applying any analytical technique that ensures that subsequent measurements are simply a matter of routine. 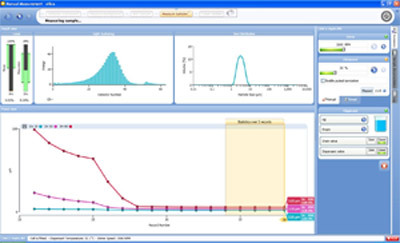 The Mastersizer 3000’s intuitive browser-style software, embedded applications intelligence and real-time feedback on all measurements serve to guide even novice users to an optimized analytical method for each and every sample. The Mastersizer 3000’s System Measurement Manager allows users to manipulate the parameters that control sample preparation and to gauge the effect in real-time. With wet measurement you can, for instance, observe the results of applying ultrasound to your sample to achieve a consistent size, or increase the stirrer speed to get the bias-free sampling required for repeatable measurement. Similarly with dry measurement, the impact of air pressure on dispersion is immediately clear and carrying out the pressure titration that underpins all successful method development has never been simpler or more intuitive. Developed methods based on Standard Operating Procedures then streamline measurement to the point of push-button operation and are easily transferred. This ensures true reproducibility from user-to-user, instrument-to-instrument, site-to-site. During routine measurement the Mastersizer continues to provide support, verifying, for example data quality and alerting the user to any problems. The result is reliable, repeatable and relevant data for all. So, as beautiful as the Mastersizer 3000 is to look at, the instrument’s real attraction is that it makes reliable laser diffraction measurements and sophisticated analysis even easier. If you’re visiting Pittcon next week, please drop by and see us on Booth 3641 and find out more about ‘smarter particle sizing’.